Burger King buying Tim Hortons in a tax inversion: Who wants to buy a hamburger from a tax dodger? On Sunday, the Wall Street Journal reported that Burger King is in discussions to buy Tim Hortons—Canada’s much-beloved answer to Dunkin’ Donuts—and move its official headquarters north of the border, a so-called tax inversion deal that would let it avoid paying high U.S. corporate rates. U.S. corporate taxes are high, and it’s anything but a shock that companies would go to extreme lengths to avoid them. But inversions—in which a U.S. company buys a smaller foreign corporation, then essentially moves its home address abroad for tax purposes—have been the subject of continuous outrage in Washington this spring and summer as the deals have grown more common. President Obama has slammed self-deporting businesses as “corporate deserters” that are “not doing right by the country and by the American people.” He’s called on Congress to fix the tax code in order to make these mergers more difficult. But because nobody really expects Capitol Hill to act—Republicans only want to deal with inversions as part of more comprehensive tax reform—the Treasury is considering unilateral measures meant to limit them. If a well-known consumer brand like Burger King actually ditches its citizenship, it’ll add some fuel to the fire. But beyond the political implications, it’ll be fascinating to see how diners respond. As the New York Times notes, the recent spate of inversions has mostly involved pharmaceutical companies, such as AbbVie and Mylan. Pfizer may still be pursuing such a deal with Britain’s AstraZeneca after its first attempt failed. For drug companies, these deals make perfect sense: Most aren’t household names, and in the end people aren’t going to boycott the medication they need because they sense a company lacks the requisite degree of economic patriotism. But a burger chain? Americans have no shortage of places where they can fill up on starch and grease. Pharmacy chain Walgreens abandoned its own plan to invert, partly out of fear that customers would revolt. It’s a little surprising that Burger King, a perennial also-ran behind McDonald’s, would take the same risk. But it will be an interesting test of how much the American public really cares about this sort of thing. The American corporate tax rate is about 35 percent, while Canada’s is about 15 percent. But people briefed on the deal negotiations said that the main driver in the talks was not taxes. Burger King already pays a tax rate of roughly 27 percent, and would shave off only a couple of percentage points by moving to Canada, according to the people briefed on the matter. Another point of attraction for Burger King is that Tim Hortons is pretty much synonymous with coffee in Canada—and coffee is an area Burger King has had trouble breaking into. In 2006, the last number I could turn up, Tim Hortons had 62 percent of Canada’s java market, compared with 7 percent for Starbucks. With around 4,500 locations worldwide, Tim Hortons has a market cap of $8.4 billion, according to the WSJ. 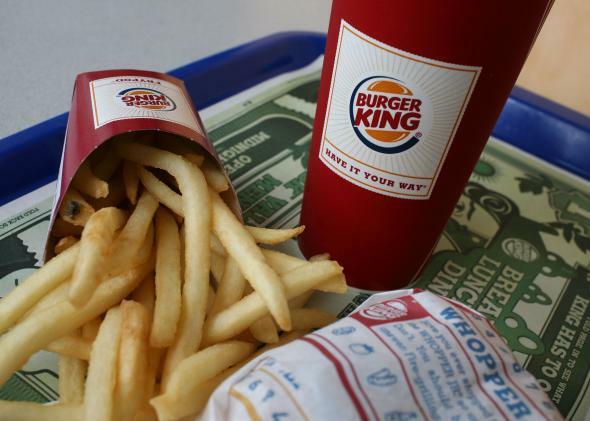 Burger King, despite having 13,000 restaurants around the globe, is worth about $9.6 billion. Making the combined company Canadian, at least on paper, may placate those patriotic concerns—at least for the Tim Hortons half of the equation. As for Burger King: If this deal happens, I wouldn’t be surprised if McDonald’s ads started featuring a few more American flags.